Brief Synopsis – Bandit and his crew once again take a bet from the Enos’ where he must deliver a package to the Governor of Texas in record time. My Take on it – This is a case where an idea worked once, so they figured it might work twice. 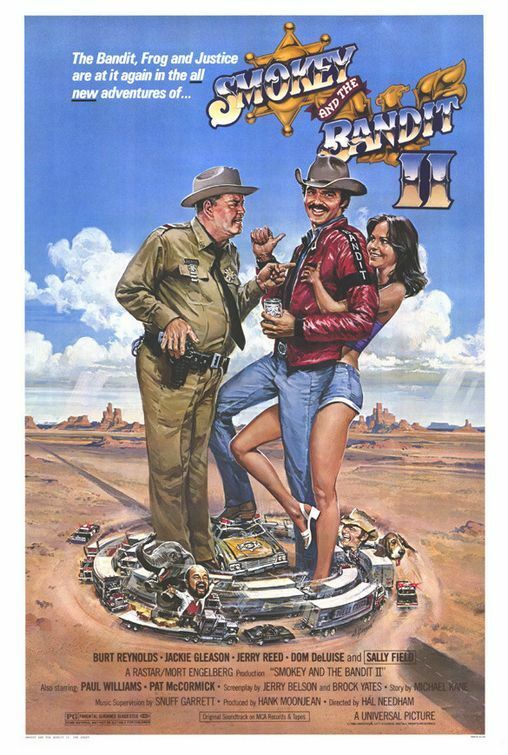 Even with Burt Reynolds, Sally Field, Jerry Reed and Jackie Gleason back for another chase, things just don’t work like they should. This film feels too much like a full rehash of the original and doesn’t bring anything new to the forefront. The one part of this film that I’ve always liked was the innovative and fun ways that they chose to stage the final “battle” between so many police cars and trucks. Those crash scenes are great to watch but they don’t manage to elevate the story high enough for it to be an enjoyable enough endeavor. Reed’s music helps with the momentum and keeping things a bit thrilling, but that too just isn’t enough. Gleason is able to duplicate his previous rendition of his lawman role, but that too isn’t as good as in the first one. Bottom Line – Feel too much like a copy of the original plot. Not enough originality makes this one more of a chore to watch. The showdown at the end between the truck and cars is always enjoyable to watch because of the ingenious ways that they chose to wreck each car, but it’s not enough to make this story work better. Reed’s music also helps a bit. Genre Grandeur Worthy? – Not even close. This one just isn’t as fun as the original and feels too much like a carbon copy instead of an original idea.